Let’s face it, thigh muscles take a beating in every sport that involves running, jumping or cycling. Muscle strains, muscle fatigue, muscle cramps, charley horses and even plain old (but painful) muscle stiffness can really take a toll on the quadriceps muscles in the front of the thigh. Kinesiology tape is a thin, stretchy therapeutic tape that is particularly effective for relieving muscular pain, spasms and inflammation. Used as both a therapeutic medical tape and a sports tape, it can be applied to any of the above conditions, providing rapid relief of pain and inflammation. This allows many injured athletes to continue to train and compete as they recover from these types of injuries and overuse syndromes. Once applied, most kinesiology tape applications can be worn up to 5 days, providing therapeutic benefits 24/7 the entire time they’re worn. 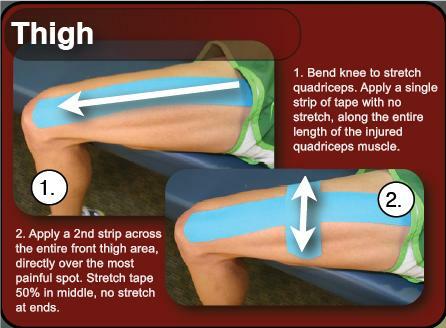 This is part of a series of posts on how to apply kinesiology tape. 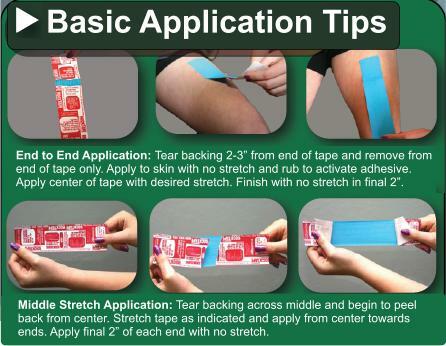 focusing on simple, yet effective, kinesiology taping techniques that virtually anyone can master. They were developed by the makers of RockTape, a new brand of kinesiology tape that has been engineered to enhance athletic performance in addition to providing therapeutic benefits.